USD/JPY continued to fall today on risk aversion, and after hitting 101.00 I adjusted my stop to 101.50. Unfortunately, it bounced higher and stopped me out before continuing to drop lower throughout the day. So, it’s unfortunate that I was stopped out early as the pair continued to drop and make a low around 99.35, but it looks like there may be another opportunity to short again as the pair corrects. Stay tuned! As expected, USD/JPY rallied back higher on the news of bailout plans across the globe, and luckily for me, it wasn’t enough to hit the adjust stop on my remaining position. The pair proceeded to drop throughout the yesterday’s US trading session and easily hit the first profit target during the morning European trading session. I would like to adjust my stop to try and catch possible moves lower, especially after this morning’s weak US retail sales and PPI data. Adjust stop from breakeven to 102.00 to lock in 100 pips on remaining position. Trail stop by 50 pips from this point on. The main theme is still the credit crisis, but it looks like traders are starting to pay attention to the economic data coming out. It still doesn’t look good for the US, so hopefully this will add more pips to this trade. Stay tuned! There are reports of a new plans across the globe, including a US bailout plan taking place that includes purchasing bank equity and guarantee interbank lending. This may prove to be bullish in USD/JPY and bad for my short. I’d like to lock in profits now. Close half position at market (102.40). Adjust stop on remaining position to breakeven. Whaddup Homies! 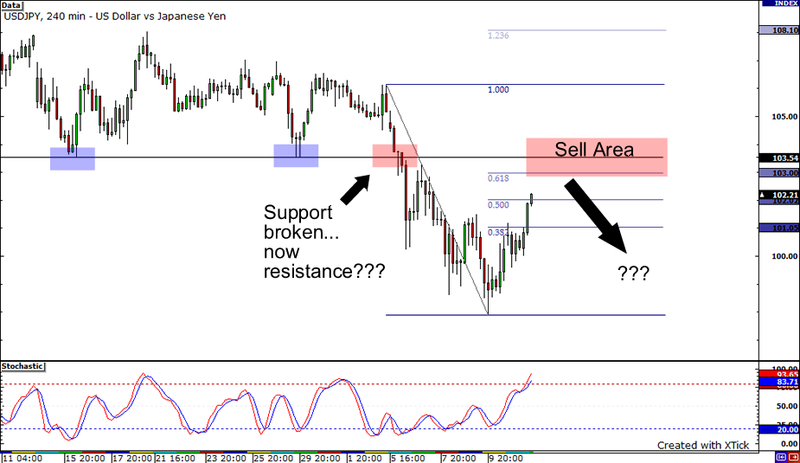 Just thought I’d drop a trade idea on USD/JPY once again to start off the week. The pair is currently rallying as risk appetites grow across the globe on further moves to instill confidence back into banks and the credit markets. Another short opportunity? First, on the chart we can see the pair ranging for a bit and on the third test of 103.50, the pair broke lower. USD/JPY is now moving back higher to that broken support. Support turned resistance? We’ll have to wait and see, but as that area almost lines ups with the 61% Fibonacci retracement area there’s a strong possibility that traders are eyeing 103.00 to 104.00 as a possible selling/resistance point. Stochastics are indicating that this move higher may be overbought in the short term. Fundamentally, we’re still in a credit crunch, but investors were a bit more confident today in taking risk after the extreme selling that has taken place over the past few weeks. Today’s rally took place on a holiday where volume was light, so the rally may have been a bit exaggerated. I’m still in the camp that we have more de-leveraging to see from institutions, but I think for now the markets want to take a breather and so we may range for a bit from here. A part of me even feels we’re closer to the end, rather than the beginning. Today’s rally may move into the Asian trading session where I look to short USD/JPY at 103.00.